Posted on March 21, 2019 at 4:32 pm. Competing in the very difficult Gold Division of the WordMasters Challenge™, Tejirian earned a perfect score of 20 on the challenge. Nationally, only 61 fifth graders achieved this result. 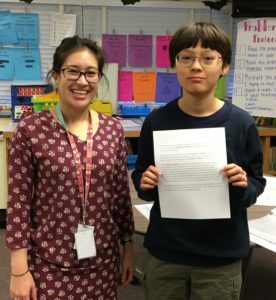 Noah was coached in preparation for the WordMasters Challenge™ by Aileen Mavity.